BleachHouseLibrary.ie: The Clubhouse Mystery by Erika McGann. Review by Endija, aged 10. The Clubhouse Mystery by Erika McGann. Review by Endija, aged 10. Cass and her best friends, Lex and Nicholas, are the Bubble Street Gang! They investigate crimes, solve mysteries and have brilliant adventures. They’ve even got their own secret clubhouse. After the annoying baby twins demolish the fort Cass has built in the sitting room, she has the great idea of building a proper fort – outdoors – that can be the Bubble Street Gang’s clubhouse. Lex’s granny suggests the perfect spot at the back of Mr McCall’s field and Cass and the gang get to work. The gang settle in quickly and begin planning their next adventure, when they realise someone is using the clubhouse when they’re not there. Stuff moves around, cookie crumbs are left behind and the door is left open. Join Cass and the Bubble Street Gang as they investigate The Clubhouse Mystery. 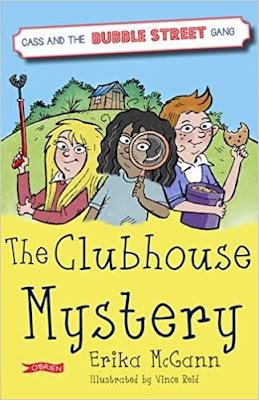 "The Clubhouse Mystery is about three kids, Cass, Lex and Nicholas and their club, the Bubble Street Gang. Someone has broken into their clubhouse who could it be? The three of them go into a fun and exciting adventure to find clues and solve the mystery. I thought the book was really good and exciting, with a lot of adventure. It was one of the best books I've ever read".